Aviation, in all of its forms, has been on the top of my 2012 bucket list. Seeing LA from a helicopter was breathtakingly beautiful, but piloting a helicopter over LA during my first helicopter pilot lesson was even more spectacular. Similarly, piloting an airplane was exhilarating, but piloting an open-cockpit biplane that is purposely stalled over the ocean to spiral to what seems to be an imminent death is the most invigorating, adrenaline pumping adventure of a lifetime. Flying a jetpack opened my eyes to the limitless possibilities of flight while proving that anything truly is possible. I set the sky as the limit and soared through one adventure to the next. 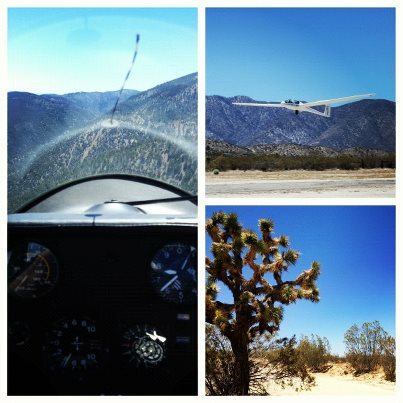 I only had one aviation bucket list adventure left on my 2012 list: piloting a glider. I made it happen with Southern California Soaring Academy. Darren and I, along with Darren’s Brother, Kevin, learned to fly by learning to soar. 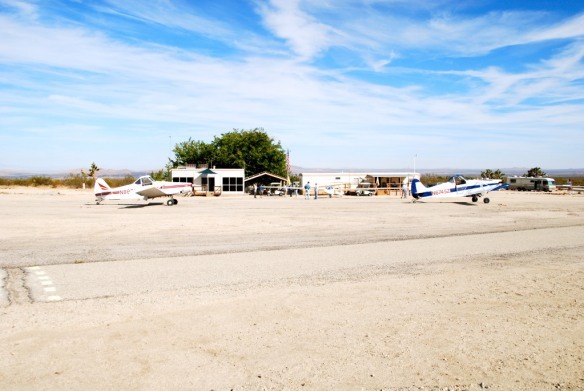 My introductory lesson with Southern California Soaring Academy was approximately 45 minutes with a 5,280′ tow. I was able to get a taste of everything I’d need to become a licensed pilot. My lesson included instruction on aerodynamics; rules of the road, or should I say air, and hands on control of the aircraft. As we soared over mountains high above the valley floor, the serenity of engine-free flight held my interest at new heights. I felt like I was part of a flock of birds rather then looking at the from afar. We, too, used the wind currents and air to glide over Angeles National Forest and the San Gabriel mountains. For the first time in the sky, I simply wanted to soar over the beautiful desert landscape and the mountains rather than experience any aerobatics. I was content with the peacefulness of gently and quietly gliding. I felt as ease in the sky, like I was part of something more. Extreme adventures have encompassed my life and filled my heart with joy, but sometimes it’s nice to sit back and enjoy the view. Piloting a glider with Southern California Soaring Academy, with the lull of the wind brushing over you, is liberating. The ground restrictions are lifted leaving you in a calm state of peacefulness. Some people go to a spa or meditate to get that feeling, but I’d choose the sky any day. 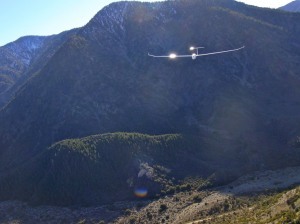 Join Us on a Glider Flight in Southern California! Glad your bucket list with flying adventures is complete….for the moment….will a journey into the “space” be next?